I still have quite a ways to go on my Minmatar skill training plan even though I don't intend on training for capital ships. But I've given some consideration in the past on whether the next race I train for is Gallente or Caldari. I'm partial to Caldari because I like flying shield-tanked ships and I already have the missile skills. So I surprised myself last night when I found myself looking to purchase an Amarr ship. This started, as a lot of things for me in EVE lately, with my quest to get the 2-run Tempest Fleet Issue blueprint copy. My standings with the Minmatar Republic are now over 9.6 (9.55 unmodified) but I now face the prospect of fighting the rest of the way to the required standings of 9.9. In addition to the epic arcs I need to do, the storyline missions that give the best standings gain are the combat ones. If I plan on doing the combat missions, I can try to have fun. That means mixing things up. I've pulled out EFT and begun making fits. I came up with a Vagabond fit that I'm going to run through the Sisters of EVE epic arc. And I don't care that a Vagabond is way overpowered. I hate Dagan and he's going to die. That's right, I'm one of those players. When I played World of Warcraft, once I hit level 60 (the level cap at the time) on my paladin I went back and stomped Hogger too. But last night I was playing around with fitting a Typhoon. The 7/5/7 layout indicates an armor tank. I had some fun and came up with a cruise missile fit that gives me an EFT generated 693 DPS along with over 78,000 effective hit points. As always, that's in perfect conditions and conditions in New Eden are never perfect. But when I went to add in the fleet bonuses I realized I had a slight problem. No bonused gang links. I purchased a Claymore in anticipation of the command ship changes so I could have a nice missile boat, but the Claymore will only have bonuses to siege and skirmish warfare links. Great for use with my Maelstrom, but not my Typhoon. Time to look for another ship. Because of the changes in skill training for battlecruisers, I have the battlecruiser skill trained to 5 in all races and my industrial/boosting pilot has Command Ships trained to 4. I can fly all of the command ships, I just can't fly all of them well. When the choice comes down to command ships that have bonuses to armor links, I really can only fly two, the Gallente Eos and the Amarran Damnation. And my missile skills, at least for cruiser sized turrets, are a lot better than my drone skills. For my purposes, the Damnation looks pretty good. I'm usually hunting the Angel Cartel so the base 80% explosive and 62.5% kinetic resists look pretty good. I just need to plug that thermal resist hole, but that's easily taken care of. I usually use my boosting ship as an anti-frig/anti-cruiser platform and decoy that draws fire away from the battleship in the gang, and from what I see the Damnation is a brick that can launch missiles. Along with the Damnation's 5 light drones the ship should fill the role in my doctrine nicely. So now I just need to buy a Damnation. I'll probably have to have an alt purchase the ship and then haul it to Minmatar space. 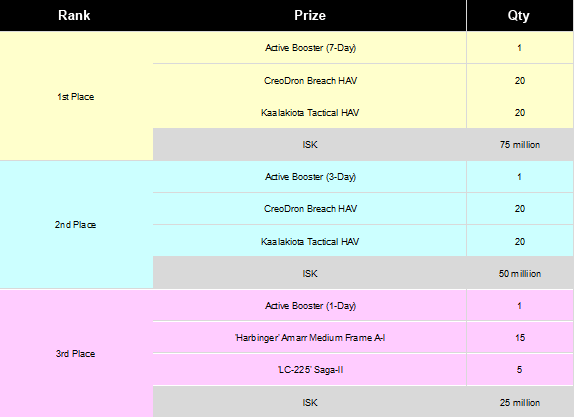 Looking at my standings, the Amarr already damn me ever day. Over the past year or so Blizzard and World of Warcraft have lost a bit of luster as the ideal for game development. So many studio's efforts have dashed against the rocks trying to be the WoW-killer that developers are beginning to try something else. But what? A game that has grown every year for the past 10 years really sounds attractive as a model. The rankings of the top twelve MMORPGs as determined by the players of the Xfire community from play on Sunday, 25 August 2013. For more details about the methodology, click here. Historical data can be found here. Sunday saw little change in the amount of time spent playing the Xfire community's favorite MMORPGs compared to the week before. An overall 0.5% decline in playtime was marked by deep declines playing Star Trek Online (-22.9%) and RIFT (-22.3%). Those declines were nearly offset by major gains spent playing Tera (+16.6%), Neverwinter (+15.3%) and Guild Wars 2 (+12.6%). Easy Access - Tera's popularity Sunday was possibly caused by the easing of the requirements to enter the Vault of Allies. From 20 August until downtime on 29 August En Mass will lift the requirement that only full alliance members are allowed in the Vault. I'm not sure what's in the content, but a lot of players want in. Unexpected - Has Trion's recent troubles led the Xfire community to abandon RIFT? Despite the beginning of the Mayhem in Mathosia event on 21 August the time the Xfire community spent playing RIFT dropped a whopping 22.3%. I haven't heard of any problems with the patch, just with Trion itself. Is this just part of the trend? New Content - Neverwinter received a 15.3% increase in playtime on the strength of the Fury of the Feywild content patch. This first module of the game features new Campaign and Call to Arms systems. Oh, and as a free-to-play game, the inevitable new Feywild Lockbox as well. Members of the Council of Stellar Management are meeting in Iceland with CCP for three days beginning on Wednesday. Unlike the winter summit last December the CSM will receive a security briefing, tucked in between a review of the stakeholder process and lunch. Will anything juicy come out of the meeting? I hope not. Don't get me wrong. I'd love to hear how Team Security is pulling off this latest crackdown that lead to rising prices on the ISK selling sites. But since I hope this lasts long enough to no longer warrant the term crackdown, I really don't want sources and methods (especially methods) disclosed in the meeting. I don't care that everyone signed an NDA. Look how much good that did for the NSA with Edward Snowden. Account security - How are the two-factor authentication methods coming along? I know that CCP needs to get single sign on implemented first, but is that done yet? Assets and bans - The closest that CCP can publicly get to posting tears is talking about the number of accounts banned and the amount of assets seized. I'd love to read not only about the number of people banned but the amount of assets seized in each region. It's probably premature to post figures about Team Security's current activities. Okay, the real reason is I don't want them to stop what they're doing to give me stats. At this point they probably need more coffee. They can gather the stats once they slow down. Customer service - Customer service? With GM Grimmi on the team, I got the impression that CCP was working on resolving petitions involving bans quicker. How's that doing? The DDoS attack - CCP may have given all of the information out already, but I wonder what system the hackers were trying to access this time. Phishing schemes - At Fanfest 2011 Darius JOHNSON in his role as CCP Sreegs talked about improving systems to fight phishing schemes. I know I've never received one for EVE. I'm just wondering if this is a big problem anymore. On Friday I posted an update about CCP's recent efforts against the websites selling ISK. We don't know the details and basically can just watch the indicators of CCP activity in the area. The easiest one to watch is the price charged by the RMT websites and the activity continues. In the past 72 hours since I gathered the information for Friday's post another 3 websites among those I monitor have increased prices. That means that since last Sunday 9 of the 12 ISK sellers and 10 out of the 14 websites on my watch list have raised prices. How much have prices increased? The average of the hikes was 17.9%. The median price of the 12 sellers rose 15.4%, from $23.07/billion ISK last Sunday to $26.63/billion ISK today. For comparison, the average price of a PLEX purchased from CCP and converted to ISK in Jita today was $32.34/billion ISK, a rise of 0.3% over the last two weeks. Last week I posted about the beginnings of an anti-RMT campaign in EVE Online that began on 30 July. But perhaps I shouldn't call the effort a new campaign as much as a shift in methods. @noizygamer @TG_3 It will be interesting to see how long it takes for them to figure it out. So far they're completely off. That led me to begin looking at the prices on the RMT sites again. Wow! In the past 48 hours the median price charged by the 12 ISK sellers on my watch list rose from $23.07/billion ISK to $25.50/billion ISK. That number would be higher if I counted AvatarBank, Koala Credits and In Game Delivery as three separate websites. But I count them as one as they are controlled by the same company. If I look at the 14 web sites, 7 have raised prices since Sunday. Of those 7, six raised prices after CCP Peligro's tweets. I haven't updated my spreadsheet with the price when converting PLEX bought from CCP to ISK in Jita, but on 11 August the rate was $32.23/billion ISK. Other factors are probably contributing to the rising prices. The Odyssey changes to ice mining and null sec ratting are probably impacting the RMTers efforts to refill their wallets with ISK. The political changes in null sec are probably playing a factor as well. After all, the Goons just announced their plans to rent space. That indecision probably affected supply as well. I don't know how many more targets are out there, or whether CCP found something that makes targeting botters and RMT operations easier. But I can say I'm enjoying the effects of Team Security's efforts. When Carbine announced the business model for Wildstar on Monday, everyone, except Massively.com, started comparing the plan to EVE Online's. I guess creating something called a Certificate of Research, Exploration, Destruction, and Development (C.R.E.D.D) which players can purchase for either $19.99 or in-game currency and then redeem for 30 days of play time might cause the comparisons to begin. That sounds a lot like CCP's 30 Day Pilot's License Extension (PLEX) that players can purchase for $19.95 (cheaper in bulk) or in-game currency and then redeem for 30 days of play time, doesn't it? Of course, some took a closer look at the way C.R.E.D.D will work and started questioning the EVE Online link. Wilhelm Arcturus on The Ancient Gaming Noob wrote the best analysis, making a convincing case that due to the nature of the game that Sony Online Entertainment's Kronos, which functions exactly like PLEX, is more relevant. The worst I read came from Massively.com's Eliot Lefebvre, who doubled-down on his initial report and continued to compare C.R.E.D.D to Guild Wars 2's Gem Exchange. Sorry, but when someone writes an article that flat out contradicts what Wildstar Executive Producer Jeremy Gaffney told the press in a couple of cases on how C.R.E.D.D. works and doesn't have other facts to back up the assertions, I consider that bad. When I state that Wildstar is not following the EVE Online business model, I don't look at the mechanics of PLEX vs C.R.E.D.D. I look at something far more basic. How much does someone have to pay to buy the game's software? For Wildstar, the price is $59.99. For EVE? Nothing. "The service we have to offer is very economically resilient," said Pétursson. "Paying $15 and playing as much as you want within a given month is a very strong value, especially compared to the price of a movie ticket." He believes that MMOs will be inversely affected by the economic crisis - people will be more likely to spend time online and in-game than watching TV or going out to the movies - and their own internal data has supported that, with people playing more frequently than they used to. "As long as we keep up our end of the bargain," he continued, "they'll be able to continue that." And CCP's pricing structure matches that business model. When I think of paying for EVE, I compare it to paying for Netflix. A little more expensive, but like Netflix, no upfront costs and I can cancel anytime I want. Carbine, on the other hand, is looking at a more traditional model with players paying for a box, paying a monthly subscription, and then somewhere down the road paying for expansions (which CCP gives out for free as part of their service). I understand the rationale for wanting to get development costs back. But does throwing a PLEX system into the game mean Wildstar is following EVE's business model? Not in my eyes. I normally don't do too many things in EVE that involve firing a weapon since Odyssey changed exploration sites. Sure, mining is pretty hazardous with Angel Cartel ships visiting every 15 minutes, but that's just a type of mining that doesn't require mining lasers. I usually do courier missions or run items to market for sale. All that requires is left-clicking a gate on the overview, moving my mouse up to the jump panel on the radial menu, and release. At the end of the trip, providing that the tracking camera actually points to the station, I then click on the destination, move my mouse up to the dock panel, and dock. Rinse and repeat. On my quest for the Tempest Fleet Issue 2-run BPC however, I'm running through COSMOS complexes trying to gain that all important faction standing. Those complexes are just a little more challenging than combat missions, mostly because the rats don't want to abandon the field and zerg you. Dirty blobbers! One of my COSMOS missions required going deep into a complex and even with two battlecruisers, by the time I got to the first gate I was out of cap boosters for my ASB-fit Cyclone. Time to warp off, restock, and reevaluate my tactics. My normal tactic for going into a mission is to look at the overview and choose my targets based on distance. That was drawing too much aggro. So I decided to do something I'd never done in a mission/complex: ignore the overview except to use it as a guide to tell me the distance to the internal gate. Now, despite what haters say, you can manually pilot a ship without needing an object to align to. So I set the Cyclone to keep 3km from the Hurricane and started maneuvering the small gang toward the gate, trying to skirt the ships I could see between me an my goal. I waited until the rats started shooting and then tracked the fire back to the ship. If the ship had a filled-in red circle, I just left-clicked on the rat, moved the mouse down to the target pane of the radial menu, and released. Once the target was acquired, click on the stacked heavy missile launcher icon on the ship control panel to launch missiles (for some reason the rats were avoiding the auto-cannon equipped Hurricane) and leave wrecks in my wake. Easy peasy. I actually enjoyed fighting that way instead of just staring at the overview and gauging distances. My Minmatar standings are only 9.52 modified/9.41 unmodified right now so after completing the missions for the last 4 COSMOS agents I'll need to complete a boatload of storyline missions. I already dual box with two ships using different weapons systems to add some spice to missions. Maybe I just found another way to make the missions more entertaining. The rankings of the top twelve MMORPGs as determined by the players of the Xfire community from play on Sunday, 18 August 2013. For more details about the methodology, click here. Historical data can be found here. After a month of basically treading water, the Xfire community had another big reduction in the time spent playing the most popular MMORPGs Sunday. The 7.4% decline in week-to-week play was led by Neverwinter (-24.6%) and two games that fell off the list, APB: Reloaded (-23.7%) and Firefall (-17.6%). The games with the biggest percentage increase were the two games that reentered the list, Runescape (+28.1%) and Star Trek Online (+20.2%). Calm Before The Storm - Neverwinter experienced a huge drop in game play Sunday following the Call To Arms: Orc Assault event. But Perfect World will launch a new module, Fury of the Feywild on Thursday. Expect a big uptick in the Xfire community's playtime in Neverwinter next Sunday. War, What Is It Good For? EVE Online is known for massive PvP battles between thousands of players. However, after the war is over players take a break, if they are not so demoralized that they rage quit. Following the end of the war between the CFC (led by the Something Awful based Goonswarm Federation) and the Reddit-based Test Alliance Please Ignore the concurrency numbers have declined. The Xfire numbers, while exaggerating the effect, are showing the decline. I listened to the CSM town hall meeting Saturday on Eve Radio and was actually struck more by a discussion in the CSM Town Hall chat channel than anything stated by the CSM. The debate was on whether for the next CSM crowdsourcing initiative CSM should hold the effort someplace other than the official EVE Online forums. Those in favor, led by former CSM candidate Xenuria, thought it was unfair that those banned from posting on the forums could not participate. Others, like EVE Radio's Wiggles, thought that not allowing those who had broken CCP's rules to participate on a CCP website was perfectly acceptable. I have to come down on Wiggles' side for two reasons. The first is practical. Where else would the CSM hold such an effort? Would they need to devote time to building a new website just for the crowdsourcing? And if they did, how many people would visit a new website to participate? CCP has provided a section of the official forums for the CSM. Using the official forums makes sure that only current players can influence the CSM's effort. The second reason is whether current players not in good standings, like those experiencing forum bans, should be allowed to participate. My answer is no. We play EVE. In EVE, your actions have consequences. Think of the official forums as high security space. The forum mods are CONCORD. Those who violate the forum rules are suicide gankers. Violate the rules too many times and the ban hammer emerges to kick offenders into the more lawless space of places like Failheap Challenge. People who wish to play in high sec have to follow the rules. Now, I don't know if Xenuria is currently banned or not. I rather suspect he is positioning himself for another run at the CSM with this position as proof that he wants to represent all of the players, including those who receive forum bans and can't speak out themselves. Politically this is potentially a good move. But for me, I recommend behaving yourself on the forums so this situation never arises. Is it really that hard? I'm still in the Ani constellation doing the COSMOS missions and I learned something important. Derived standing gains only go up so high. Normally that doesn't matter. After all, who's going to have unmodified Minmatar faction standings of 9.1 and unmodified Gallente standings of 8.0? I don't think too many people. But I'm one of them. "As the Minmatar republic is 'liked by' a factor of 8.00, this translates to 80% of the increase given to the Gallente Federation. Assuming that the Gallente Federation standings gain was 10%, the derived standings gain to the Minmatar Republic will be 8%." Pretty sweet, right? Except when my unmodified standings are at 9.15. Doing Gallente storyline missions does nothing to increase my Minmatar standings anymore. Of course, on the flip side I can't damage my Amarr and Caldari standings anymore either as I hit -5.0 unmodified with the Amarr and -2.0 with the Caldari a long time ago. With the social skills in place I even have a positive modified standing with the Caldari. To tell the truth, I wasn't looking forward to an extended stay in high sec Gallente space after completing the high sec Minmatar COSMOS missions. I would have done so because I really want that Tempest Fleet Issue 2-run BPC. If the derived standings would apply that would make my task much easier. Also, with a modified standing of 8.4 with Gallente I likely could get the Federation Navy Comet and Vexor Navy Issue 2-run BPCs if I complete the Gallente COSMOS missions. But after spending another week or two in .5 space I'll return to low sec and my normal activities. Besides, who wants to do missions in high sec anyway? I'm doing the high sec COSMOS missions in Metropolis for the precious faction standings gains they provide. For those planning on running a COSMOS site for Minmatar faction gain I really recommend finding a reliable guide because these aren't your normal EVE Online missions. First off, actions really do have consequences. COSMOS mission are a one time thing. That means if you fail a mission, you fail forever. No shiny 3-run faction blueprint copy for you. And if completing the mission is required to complete the final mission in a series that provides phat loot? Sorry. Maybe the mission item is up for sale and you can get the item by throwing ISK at the problem. Second, mission items often are available on the contracts market. Yes, people still do use contracts. So for those running out of time to complete a mission (or just don't want to spend the time period) start searching the market. COSMOS missions often require items found in the sites in the COSMOS constellation and are farmed for sale. When doing a mission last night the first room I entered had a Noctis cleaning up the trash. I'm finding that COSMOS sites are potentially a good place to do some salvaging. I know that unless I'm camping a spot I'm not doing any salvaging myself, so others can come in if they are so inclined. I saw a one-day old player in a Reaper last night watching the show I was putting on with my 2 battlecruiser fleet so I went ahead and abandoned all the wrecks in the room and moved on. I hope he found some good things. Third, if you aren't purchasing all the items (an expensive proposition) then expect to read the mission text. The normal EVE mission has a handy link that players can use to set the path to the system hosting the mission site. Not the COSMOS missions. Nope. Have to read the text. If you want to set the autopilot, you have to read the text. And then sometimes you have to search for the mission items required to complete a mission. I went on a little trip and had to go to a complex in Barkrik to get an item that would allow me to enter the complex in Hjoramold to complete the mission. Hmmm. Replacing the usual way of marking a system with the COSMOS way would play havoc with mission botters. But I think it would take up a lot of developer resources to change the text of all the missions to allow the system to pop into the text. Oh well. Next, the agents don't just offer a random set of missions. They offer two or three very specific missions. I actually now have a spreadsheet to record which agents I've finished, the faction gains for each agent, and which agents to avoid. I really don't want to deal with an agent where I will take a Minmatar faction standings loss. I'd recommend doing some research beforehand to make sure you really want to talk to an agent. Finally, the rewards. Regular missions just hand out ISK. Storyline missions hand out ISK and/or implants, with an occasional high value item. The reason for doing COSMOS missions is faction standings gain and faction blueprint copies. Last week I posted that the BPCs created meta level 3 items. I looked at the blueprints I received last night and they created meta level 6 items. Of course, those blueprints also require some special items to manufacture. For the Minmatar BPCs, they require Sleeper items. And way back in the past I obtained some in the Ani system. That's right, Sleeper items in high sec. I don't think they are the same things as found in wormholes, but CCP provided another farming opportunity for players in high sec. So for those looking to do the COSMOS missions, remember that the missions are different and to think outside the usual mission mentality box. Or perhaps throw ISK at the problem. I'm sure the residents of the COSMOS constellations would appreciate the windfall. My Ship Has A Logo On It? I considered getting a new desktop computer for a couple of months. My all-in-one just wasn't cutting it performance-wise. I stopped playing The Secret World because the computer just couldn't handle it. After looking at the new performance specs CCP released in June I started wondering how the computer would handle them. I figured not too well. I went to a site called Can You Run It? and discovered my all-in-one couldn't run any MMO I wanted to play at the recommended level. Yikes! With new games like EverQuest Next/Landmark and Wildstar coming out Soon™ I figured I needed to buy a new computer. I originally targeted after Christmas because of all the sales that outlets traditionally hold. But my computer didn't cooperate and failed Friday night. Since I planned on replacing it anyway, I went out and bought a new computer. Not a top of the line computer, but a much better computer than I've ever owned. I think it's an HP, but I was more impressed with the i5 processor, 8 GB RAM (expandable to 32 GB), and NVIDIA GeForce GT 630 graphics card with 2 GB of dedicated video RAM. Like I said, not top of the line, but I only paid $630 for it. So of course I went and got a 27" monitor at the same time because they were $50 off as well. After buying a service plan and Microsoft Office, the total came out to be $1300. I was laughing as the total came up. The guy running the cash register thought it was because I spent so much. I was actually laughing because I spent so little. Yes, I really hadn't seriously gone shopping for a new computer in quite some time. Prices have come way down. Should I have ordered a real top of the line gaming rig with an i7 processor and all the fixings? Perhaps. But I'm pretty happy with the performance so far. After installing EVE I changed the settings to optimize for graphics instead of performance and the computer runs real smooth. In fact, I noticed for the first time that my Orca has an Outer Rings Excavations logo on the front top. The bigger screen also makes a difference. More space means my overview is taking up less real estate on my screen. That will come in handy when I start running exploration sites again. I would sometimes have issues with the cans travelling behind the UI elements I think that problem just went away. Of course, I'm currently on the quest for the holy Tempest Fleet Issue BPC, so that may have to wait a couple of weeks. But for right now I'm happy with a computer that is performing exactly the way I want. The rankings of the top twelve MMORPGs as determined by the players of the Xfire community from play on Sunday, 11 August 2013. For more details about the methodology, click here. Historical data can be found here. With the end of summer just a few weeks away, the Xfire community's interest in MMORPG's is picking up. For the second time in three weeks the amount of time spent playing the 12 most popular of the games increased; this Sunday by 2.7%. The surge was led in percentage terms by Lord of the Rings Online (+16.2%), Guild Wars 2 (+12.5%), and APB: Reloaded (+12.2%). The two games with the biggest drops in interest, Runescape (-35.9%) and Metin 2 (-22.2%) fell out of the top 12. Party Time - Last week saw the introduction of the Queen's Jubilee to Guild Wars 2. The lastest installation of ArenaNet's every other week content patch led to Xfire members spending the most time playing the game since 9 June. Titans of Industry - Star Wars The Old Republic witnessed a 6.5% gain in play time Sunday following the launch of its 2.3 patch called Titans of Industry. The new story arc and two new level 55 flashpoints brought back players, although not with the same success as Guild Wars 2's Queen's Jubliee. Sunday's increase did not offset the previous week's decline. Boredom Setting In? - I can't help but wonder if all the new shiny content from all the other games are leading to a drain on RIFT players. The last content patch, Summerfest, launched on 25 July and is an iteration on previous summer events. Apparently the news that Scott Hartsman returning to Trion as its new CEO did not excite players. Two weeks ago CCP published some graphs showing a decline in the amount of bot bans since the launch of Odyssey. CCP Stillman attributed the drop in bannings due to the changes to ice belts and 0.0 ratting. While the logic sounded good, I couldn't independently confirm these finding through the chatter on the botting forums I visit. Clearly I needed to get back to work. If botting really had slowed down I should see the price of ISK on 3rd party web sites rise. Of course, that assumes that demand remains the same. So I put together my own index of 12 ISK sellers and 14 ISK-selling sites to begin tracking the price. Just in time because CCP Stillman had a couple of interesting tweets about CCP Pelegro. I laugh when I read comments stating that putting features into an MMORPG like a mineral valuable to both players who have played 5 days and players who have played 5 years is bad for a game because the experienced players will come back and take all the resources from the noobs. The way a lot of games are built, doing so would cause massive problems. But not in EVE Online. The way CCP has designed the content, players stick around in high sec, giving New Eden the feel of a living world. In many games, a new player has a lonely slog up to max level. CCP's design is much better. Last night as I prepared to begin my quest to obtain the holy Tempest Fleet Issue 2-run BPC I was struck at the usefulness of the COSMOS sites. At first glance these appear mainly useful to the relatively new player, yet here I am a 4-year vet and I find the content worthwhile. Actually, at this point in my plans I find them essential to meet my goal. So what makes them so useful? First, at least in the high sec Minmatar COSMOS constellation, a player can raise his/her faction standings from 0 to over 5. Did I mention that is without learning any social skills? That is useful in so many ways. For instance, once a player reaches 5.0 with a faction (including social skills), that unlocks all the level 4 missions that faction's agents hand out. With the proper social skills trained a player doesn't even need to finish all the COSMOS missions. Next, the COSMOS missions hand out some phat loot in the form of meta 3 blueprint copies. The meta 3 items are pretty good because they have reduced fitting requirements. I know I was using 1200mm Jolt artillery on my Maelstrom until I learned enough skills to fit tech 2 1400s. Giving new players a way to get some good gear they can actually use is a plus. For the lore junkies, the COSMOS sites provide some nice background on the history of New Eden. I suggest reading the quest text for those interested. Mark726 has written about a lot of the sites players visit over at Eve Travel. Experienced players will also appreciate a path to an unmodified standing of 5.0 with a faction since that is the minimum corporation standing to erect a POS in high sec. Given the way corporation standings with factions are calculated, the unmodified standings of corp members is used. Some players actually have a service in which they anchor a POS for corporations who don't have the required standings. Hey, I have unmodified standings of over 7 with both the Minmatar and the Gallente. Maybe I should get into that business. And of course, the COSMOS missions are good because getting the 2-run Tempest Fleet Issue is considered a COSMOS mission. So in one way all my activity over the past two years has been part of an overarching COSMOS mission. Pretty crazy when I think about it. Time flies when you’re having fun. Today marks the four year anniversary of creating my first EVE Online character. Time to look back at the past year, what I did and didn’t accomplish, and make plans for the future. The rankings of the top twelve MMORPGs as determined by the players of the Xfire community from play on Sunday, 2 August 2013. For more details about the methodology, click here. Historical data can be found here. The Xfire community went back to its long term trend of disinterest in MMORPGs, with the previous week's gain in time spent playing games from the genre almost completely evaporating on Sunday. The biggest drops in play time were recorded by two games that fell out of the list, Maple Story (-41.2%) and APB: Reloaded (-29.5%). Games bucking the 3.7% summertime slide were led in percentage terms by Aion (+26.5%), Planetside 2 (+17.8%) and Runescape (+16.3%). Beating the Heat - Aion decided to get into the spirit of fun by holding a summer block party over the weekend. Not only could players receive 30 minute buffs from drinks but also harvest ice and ice picks from mobs. Combine an ice block and a pick and receive an ice box containing a prize. These prizes were available in the in-game store as well as through normal game play. I guess a lot of players didn't want to pay real world money. Convention Bounce - This past weekend saw Sony Online Entertainment hold its SOE Live player gathering in Las Vegas. Just as we saw with EVE Online following CCP's Fanfest in April, interest in Planetside 2 received a bump. After a two-week absence from The Digital Dozen, will the excitement that generated a 17.8% increase in playtime last and keep the game in the list? People Like To Fight - While the change to Runescape 3 on 22 July wasn't enough to launch the game into the list, the Battle of Lumbridge apparently is a hit. Sunday's 16.3% gain was the second Sunday of the world event. Players get to choose elements of the conflict and for this week players on both sides chose to enhance their DPS. This week players will vote on the NPC reinforcements they will receive. From the news we've seen recently getting players more involved in these types of decisions is becoming a thing and as it succeeds I expect to see more voting in the future. NOTE: I originally planned on writing up a summary of the EQNext reveal. But with so many other places writing up summaries I decided to look at elements of the game instead. I think I've played in EVE Online's low sec way too long. The idea of carebearing in territory others consider dangerous is now rather attractive. After watching the reveal of EverQuest Next a couple of times and listening to Dave Georgeson (aka Smokejumper), the Director of Development for the EverQuest Next franchise, I figured I could change up the way I normally approach a game and play the bad guy. After all, SOE is going around stating that EverQuest Next is a sandbox and that players' choices matter. The example that Georgeson gave in the reveal concerned orcs. 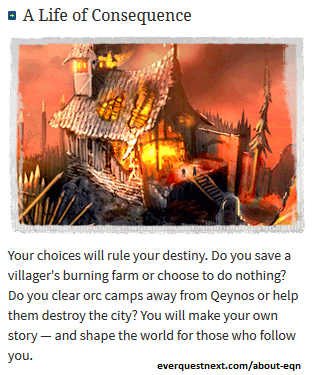 A player could help the locals fight orcs, or the player could help the orcs slaughter the locals. The choice is yours, and the choices have consequences. The EQNext website implies I can play a "bad" character. He made it sound like a player could make friends with the local orc faction. So could I wander out far away from settled lands, make friends with the local orcs (or whatever the dominant NPC type is in the local area) and then set up shop gathering rare crafting materials? Think the mountain men interacting with local native Americans back in the 18th century. I could even get a jump on learning gathering and crafting by signing up for EverQuest Next Landmark. I'm sure some of what is in that game will transfer to EverQuest Next. Of course siding with NPC's who are on the wrong side of authority is nothing new. During the live events leading up to Incursion in EVE, we witnessed many players role play as Sansha Nation sympathizers and actively aid the live event actors against the efforts of other players. I thought that was pretty cool, although the players losing ships probably didn't think so. One of the problems that the Sansha Nation sympathizers had is that the NPC AI would shoot the sympathizers. Many players wanted a way to, if not actively work with the NPCs, to at least not get fired upon. Listening to Georgeson talk it sounds like the AI governing EQNext's NPCs is more advanced than CCP's and players can actually aid orcs without having their heads ripped off if they act properly. Q. So last night during one of the panels, the question came up about disrupting a Rally Call if you wanted to be the bad guy. Team gave a definitive yes, that you would be able to do that. I would really like for you to elaborate on what kind of system you'll use to do that. Darrin McPherson, Lead Designer: Destruction probably comes in the form of not doing it. You can choose to not participate, but generally RC are not going to go in reverse. If the RC is to build up the city of Qeynos, it's not going to happen in reverse. Terry Michaels, Senior Producer: There are many ways in which RC's can be progressed and there are ways in which players can disrupt aspects of that progression. For instance, if there was part of a RC that required you to collect wood in the area, you could disrupt it by going in and cutting down every tree that you see and making sure that there is no wood that anybody else can get. But that doesn't mean that not getting wood is going to stop other avenues of progression. Dave Georgeson: We're not actually building a game that's set up so that you can grief. Uh, oh! Sounds like if the NPCs I've cultivated good relations with become the target of a Rally Call, I better not help them or I could get banned for griefing. Which is too bad, because helping my pixelated friends could get me good standings not only them but a wider group of NPCs I might want to cultivate standings with. Standing aside to avoid an account ban could possibly hurt my standings and undo a lot of work, or at least make future actions much harder. Of course, I don't think the game is even in alpha yet, so many things can change. But I'll need to remember that not all sandboxes are run alike. Assuming, of course, that EQNext is actually a sandbox after all the development is complete. Today was the big reveal of EverQuest Next. I think the gaming press was more excited about the game than the people in the room. SOE has a tradition of not putting their best foot forward and that occurred again today. Quite frankly, Dave Georgeson (aka Smokejumper), the Director of Development for the EverQuest Next franchise, did not have a strong performance. Even with the material at his disposal, in my opinion he stunk the joint up. I don't think he impressed the people in the room either, because when John Smedley came out afterwards and asked the crowd if they wanted to hear more, the crowd wasn't too enthusiastic. Don't get me wrong. Getting past Smokejumper's poor performance the content of the presentation offered enough to intrigue me. And the fact that another game, EverQuest Next Landmark, is coming out this year to allow players to help build the world of EQNext is awesome. So I'm cautiously optimistic about the game, but I don't want to get too excited and get my hopes up. I'll take another look at the information and write something more comprehensive on Monday. The CCP New Eden tournament season doesn't end with the finals of Alliance Tournament XI on Sunday. Beginning on 12 August running through 4 September the first open DUST 514 tournament will take place. CCP will co-host the Prime League Tournament with Urgent Fury. Unlike EVE's Alliance Tournament, the DUST 514 tourney will take place on Mondays, Wednesdays and Fridays with two leagues, a North American league and a European League, each vying for a skill point accelerator, vehicles, and ISK. While the prizes are nowhere near the scale of those received by the winners of ATXI, the winners of each league do get to do something unique: name a planet. That's right, DUST 514 players will change the star map, at least just the tiniest bit. The names are subject to CCP approval (thus keeping the TTP number above 0) but DUST players will make their first lasting impression on EVE Online. Thinking about the move, I can see why naming planets is a good prize. Whenever a battle is fought on one of those planets the victors can crow just a bit. Or eat crow if they lose. And the idea of marking an event in-game is not new. Pandemic Legion has a monument marking one of the Alliance Tournament victories in Amamake on the Osoggur gate. The one thing I wonder about is the reaction of EVE players. I'm sure a lot will complain about DUST "taking over" their game, but with DUST already playing a factor in faction warfare and with long term plans to somehow become involved in the sovereignty system, renaming a couple of planets is small potatoes in the grand scheme of things. Then again, I'm a Minmatar pilot and our home system of Pator already has all the planets named. I can't help but wonder if CCP opened up Pandora's Box and now players will want to name all the planets.